We are fortunate to live in the heart of the deepest boatbuilding tradition on the continent, reaching back to at least the Age of Exploration. Over 400 years of discovery, commerce, fishing, and pleasure have brought us evolutions of design and construction to suit the unique Chesapeake challenges, and in spite of the global reach of fiberglass and new ideas, Bay-built boats are still available from capable artisans and builders. For some, the commitment to buy a boat is substantially enhanced by participating in the building process and, most importantly, sealing the deal with a handshake from the person who will create your dream. Here is CBM’s list of notable boatbuilders and specialty boat shops around our watershed. Reid Bandy harnesses his passions for fishing and making things and converts them into boatbuilding energy. He’s built high-tech carbon and E-glass on foam boats for himself and others in whirlwind fits of creativity. His latest project is a keel-up rebuild of a 60-year-old Rybovich, which was once owned by a mafia guy called Tony the Tuna. On the side, he completed a 50-knot, 24-foot carbon fiber center-console skiff, powered by a 90-hp, two-stroke Yamaha outboard intended to get to the local fishing hotspot way before anyone else. In addition to the otters, fossils, and maritime history exhibits, the museum hosts the Patuxent Small Craft Guild in the Patuxent Small Craft Center. Under the direction of the museum’s boatwright, volunteers with wood and tool skills maintain the museum’s historic fleet including the museum’s skipjack, Dee of St. Mary’s. They host boat-building classes year-round. After spending his early years working in Don Loweree’s boat shop, Tom Campbell began building boats in 1991 under his own name in a small shop in Cordova, Md. His first boat was nearly done when he had a chance to buy the old Shaw’s Boatyard in Oxford. Campbell and his two brothers joined up, changed the name to Town Creek Boatyard and consequently found themselves in the full-service marine business. Doug Campbell is a certified Cummins marine tech, among other skills. P.J. handles boat sales. The Town Creek acquisition led to expansions to two other prime Oxford locations—Bachelor’s Point and Jack’s Point. From 1993 on, Campbell has maintained his passion for boatbuilding with custom projects for discerning owners with finished boats from 31 to 42 feet. Campbell boats tend toward classic Spencer-Lincoln Downeast designs and layouts suitable for extended cruising on the Bay and beyond. The Campbell 31 “launch” is a Bay-style inboard cruiser. Tom’s son, Allen, handles varnish, rigging and whatever else. Tom’s wife Susan manages the office essentials and the rest. Nelva Capps grew up around the North Carolina sport-fishing docks and boat shops and worked as a mate at the age of 12. He built his first boat, a 21-foot Carolina sound-runner of his own design, when he was 27. Since then, he moved to Virginia Beach, bought a full-service marina and set up shop to service the vibrant blue-water and Chesapeake sport fishing community. Capps builds cold-molded marine plywood and epoxy fishing boats from 25 to 60 feet. Capps builds a boat each winter. On the boards for this year is a 40-foot convertible sport fisher. The Chesapeake Bay Maritime Museum preserves the Bay’s deep history on an 18-acre campus with exhibits, library, archives and a full shop to restore and maintain historically significant boats. The crew of expert boatwrights also provide youth and adult boatbuilding programs, workshops, and lectures year-round. Dave Mason and his crew handle boatbuilding projects from design to delivery covering a wide range of purposes including commercial passenger, fishing, and private use. The company builds one-off Bay deadrise and Downeast-style hulls as well as molded fiberglass center-console boats in sizes 27, 26, 38, 46, and 50 feet. Chesapeake Boats are particularly popular with pirate-boat excursion businesses, commercial and charter fishing customers, and passenger cruise operations. Consequently, Chesapeake boats are most often built to exceed U.S. Coast Guard requirements for inspected passenger-carrying certification. Chesapeake Light Craft is considered the world’s most successful kit boatbuilding supplier with more than 30,000 precut boat packages sold in over 70 countries. The kits come complete with instructions and materials to complete any of over 100 designs, including kayaks, sailboats, dinghies, skiffs, rowing craft, canoes and you name it from eight to 31 feet. They even have a new teardrop trailer camper for land-lubbing adventurers. They also offer stitch-and-glue boatbuilding classes to help you get going. Patrick Mertaugh acquired his boatbuilding and repair skills at the Landing School in Arundel Maine, perhaps the most comprehensive and important boatbuilding trade school in the country. Subsequent years working in boatyards and shops brought him to the Chesapeake to establish his own business. Mertaugh is capable of handling modern composite boat work, however he tends toward more traditional boatbuilding methods—carvel, lapstrake, strip-plank, cold-molded plywood and stitch-and-glue techniques. Dave Hannam restores classic wooden boats in Beverly Beach, Md. He’s been at it under his own sign for over five years after years in other shops. He’s a one-man operation working on a couple of heirloom boats at a time. Examples are vintage Chris Crafts, Centuries, a 1935 Garwood Gentleman Speedster—generally priceless runabouts. He’s also saved old wooden dinghies, sailboats, and other gems. Composite Yacht is a father-and-sons family business conveniently located on the Choptank River at the eastern base of the Route 50 bridge. Martin Hardy has more than 40 years of boat design and boatbuilding experience. Youngest son Lewis manages the crew while older brother Rob handles sales, marketing, PR, project delivery, and boat brokerage. The operation features major refit, repair, refinishing, and custom boatbuilding. Their boats include Bay, Carolina, and even Palm Beach express designs, from 26 feet to 55 feet. Jerry LeCompte specializes in restoring antique and classic wooden boats. Dockside Boat Works handles all phases of restoration in-house including bottom repair/replacement, structural repair, planking, engine rebuilding, woodwork and finishing, upholstery and custom interior work. Designer/builders Mick Price and Tom Weaver combined their years of experience to create the Eastport 32, an inventive coastal cruiser with water sports, fishing, travel, and cocktails in mind. Since 2006 they have delivered 18 boats. These are modern composite boats with a single-level deck, galley-up forward of a spacious cockpit, plenty of shade under a hard-top, and twin common-rail diesel engines. Her most distinguishing feature is her drop-down tailgate transom, which opens the way for swimming, paddle sports and even driving golf balls. The duo also has plans afoot for smaller and larger versions up to 44 feet. Dennis Elzey has been building Chesapeake Bay deadrise-style boats for over 30 years, 16 under his own name. He has molds to build 18-, 21-, and 24-footers, and has built several custom one-off boats from 13 to 52 feet long. He recently opened a new facility near Cambridge Park and Cambridge Creek, which will include a full-service yard and ship’s store. He’s developing tooling for fresh 28- and 32-foot Bay boats modeled on David Sintes-designed boats he previously built and delivered when Sintes was still with us. Eugene Evans and his extended family have been building Chesapeake Bay deadrises and skiffs for more than 30 years. In addition to hundreds of working watermen, organizations, and municipalities, their customers include Disney Cruise Lines, Aberdeen Proving Ground, and the Chesapeake Bay Foundation. Standard Evans production boats include eight models from 25 to 50 feet, all of which can be customized to suit the customer’s needs. Additionally, they have built commercial catamarans, pirate-style excursion/party vessels, and tour boats. The crew also performs major repair, refit, and repower work. Carson Forrester builds boats to order out of a small shop in Suffolk, Va.. After spending time in notable Carolina yacht building shops, he decided to start his own, beginning with small hunting-style skiffs and progressing to more elaborate sport fishing boats up to 23 feet (so far). His preferred method is cold-molded marine plywood and epoxy. Jim Floyd took his skills as a master carpenter, sport-fisherman, and contractor and combined them with a fascination with the groundbreaking SeaCraft variable-deadrise hull design to develop his own tournament sport fishing boat concepts. The first boat out of is shop was Fin-Ally, a 58-footer that turned heads and attracted orders. Since then he’s delivered 29 boats from 36- to 78-feet long. F&S boats are cold-molded marine plywood and epoxy. Belkov Yacht Company designs, cuts and assembles the interior joinery. Bill Judge builds 13 boat models from 18- to 42-feet long, all fundamentally Chesapeake Bay-style boats. Over more than 20 years of steady work, he has acquired or built the tooling to produce boats for essential Chesapeake purposes from crabbing to sport fishing to commercial work, picnicking, cruising, and overnighting. The 42XC is a full-on bluewater-capable fishing machine suited to tuna and white marlin pursuit. Judge works on a personal basis to build and configure boats to meets an owner’s aspirations. The Judge 265CC has become a favorite of some of the leading sport fishing guides and top-flight anglers on the Bay. Joe Reid has been making sawdust and building boats for over 35 years. He learned the craft in the famed Hartge Yacht Yard in Galesville, MD under the tutelage of some of the old wood codgers who remained from the Trumpy Yacht glory days. From there he became the chief interior carpenter for the Voyager Boat Company in Florida. He returned to Galesville in the early ’80s to hang up his boatbuilding and repair sign in an old oyster shucking house. Business grew and in 1999 he moved to a proper workshop at Holiday Point Marina on Selby Bay. He collaborated with Annapolis yacht designer Mike Kaufman on a line of Thomas Point power boats, which are fetching combinations of concepts from Bay deadrise, Downeast and Carolina boats from 30 to 43 feet. Reid builds the boats to order with double-planks of western red cedar glued with epoxy in offset longitudinal layers amounting to a solid inch of hull material. The planks are faired, epoxy-sealed and finished with a layer of 10-ounce cloth. He occasionally builds Smith Island-style crab skiffs or whatever strikes a customer’s fancy, just as long as it involves sawdust instead of polyester resin and fiberglass. Mathews Brothers Boats—Building an Eastport 32 deck. Pete and Bob Mathews built their business by acquiring time-tested designs and molds from famous builders who were retiring. It began in 1995 in St. Michaels with 18- to 22-foot Lempke skiffs, which were popular with commercial fishermen. In 1999, they acquired Cecil Robbins’ shop and the molds for his classic 29- and 40-foot deadrise boats, and they moved to the Chicamacomico River near Cambridge. The orders came in and they shifted to a larger space in Denton to expand the line and diversify into full-service maintenance, repair, refit and storage. They subsequently bought Bob Stein’s shop and marina on the Choptank shore to provide launching, hauling and dockage to their capabilities, and they renamed the place—Mathews Landing. Bob left the business in a friendly buyout a few years ago. Mathews is developing a new 26-foot design based on a Ricky Roe Bay-boat design with an eye to this year’s U.S. Powerboat Show. The company also builds the Eastport 32 and an occasional Hampton one-design racing sailboat. As a third-generation Reedville boatbuilder, George Butler embodies the Chesapeake deadrise tradition. However, the general demand for v-bottom, cross-planked boats has waned as molded fiberglass has taken over. Butler is eyeing retirement but remains a key resource for keeping the old boats going. In between boat repair projects, he sometimes finds time to build the famous Butler skiff and other bay-worthy boats made to order with local white oak and Carolina white cedar. In 1998, Jim Weaver gave in to his big-game fishing obsession and leveraged his successful construction skills to build his own 58-foot bluewater tournament fishing boat. The first outing was to a tournament in Cancun. At his return stopover in Palm Beach, a gentleman saw the boat, made an offer, and bought the boat on the spot. Since then, working in collaboration with renowned design firm Donald L. Blount & Associates and Annapolis-based wood interior wizard Larry Belkov, he has delivered 35 boats from 43 to 97 feet including six 80-foot and three 75-foot high-speed luxury fishing machines. His 43-foot models are the closest thing to Bay-style boats, and they are lovely. All of his boats are hand-built, one-off, cold-molded marine plywood and epoxy. George Hazzard continued a family boatbuilding and restoration tradition with the opening of his shop in an 8,400-square-foot spinach packing plant in 2003 expressly to restore and maintain wooden boats. Hazzard and his capable team can handle major and minor projects up to 50 feet indoors. Wooden Boat Restoration produces award-winning results with an uncompromising dedication to perfection. 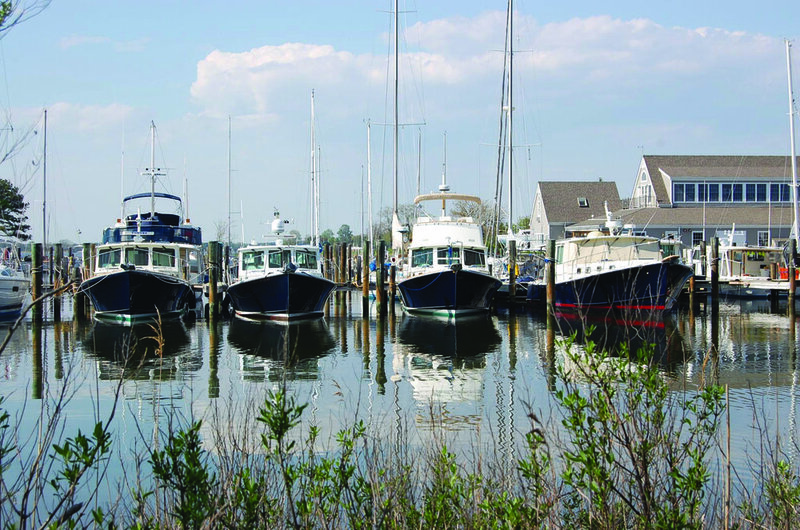 The Patnovic family operates a full-service marina and boatyard on Maryland’s upper Eastern Shore. Over the span of 20 years, John Patnovic and his crew have developed a global reputation as the premiere Bertram 31 restoration resource. Salvation might be a better word, since these timeless C. Ray Hunt-designed boats most often need major upgrades—fuel tanks, engines, decks, trim and paint. And they are worth it. Patnovic occasionally acquires old Berties to restore and sell. More often, the Worton Creek crew repairs, refits and services these vintage cruisers for discerning owners. Additionally, the team has saved and returned to service notable wrecks ranging from a totaled Viking 58 to a 91-foot Berger yacht. In 2011, Patnovic purchased the complete Post Yacht inventory of designs, material, equipment and tooling, and the Worton Creek team is well-positioned to build upgraded versions of these highly regarded blue-water fishing boats. Over the past 38 years, Steve Zimmerman quietly built a marine services juggernaut, which has grown to include four full-service locations in Virginia (2), Maryland and North Carolina and a new operation opening soon in Charleston, South Carolina. Custom boatbuilding has been part of the company’s DNA, beginning in 1983 with a cold-molded, 27-foot, Phil Bolger-designed launch. Eighteen boats have followed including Downeast cruisers up to 46 feet and three classic sailboats. Zimmerman has cultivated teams of American Boat & Yacht Council (ABYC)-certified technicians capable of virtually any repair, service or boatbuilding project. Joe Evans spent a couple of arduous decades as a member of various rag-tag crews of excellent boatbuilders here on the Chesapeake. He misses some of those days.